Simple ≠ plain. It’s important to note that simple and minimalist doesn’t mean plain or sparse – it can also mean that your wedding centerpieces utilize the look or texture of a limited number of greenery or floral options. Alternatively, instead of dramatic floral arrangements in the center of each table, you can opt for multiple arrangements in smaller vases placed in clusters or running down the length of the table. Even going with a monochromatic theme – flowers of a single color – is a great way to create a simpler and impactful style no matter what type of wedding you plan. Structural and dramatic. One beautiful way to create the most impact with the least number of flowers is to incorporate floral branches into the arrangements, accented with single flower stems or buds. These type of simple floral wedding centerpieces would look exceptionally beautiful in a number of urban settings for a downtown Pittsburgh wedding. Mix up the containers. There’s elegance in simplicity, but you still want to keep your floral centerpieces attractive and complementing to the overall theme of your Pittsburgh wedding. One way to do that – especially if you want to use neutral-colored flowers or monochromatic arrangements – is to use simple glass vases all in the same style or add a little bit more visual appeal and mix up the shapes and sizes of the containers. Complement the décor. If you love the bright and airy look of all white linens, add a vibrant pop of color and texture to the table by using a vine-like plant – ivy and bougainvillea are two gorgeous options and serve not only as the floral wedding centerpiece but also gives the space a natural and elegant feel without using other décor accents aside from the table settings. 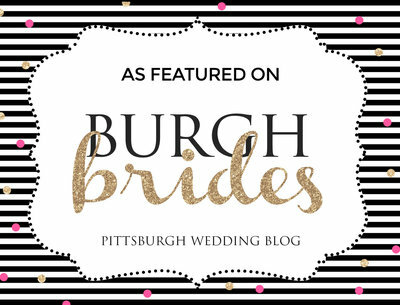 Pittsburgh florists can easily work with brides to create the perfect simple floral wedding centerpiece – contact me to learn more about Pittsburgh wedding vendors or to talk about your upcoming wedding photography!